If you are a first-time sewist, the pains and joys of learning how to sew are enough of a burden. You don’t need a powerful workhorse with gazillions of bells and whistles to turn you off before you even started. You need a nice and handy machine that will help you get acquainted with the basics in a matter of days. Chances are that Brother XM1010 is just what you’re looking for. It probably won’t meet the needs of an professional or experienced sewist who makes a living out of this craft. That wasn’t Brother’s intention with this model. They wanted to build a machine that is very affordable, while still offering just enough functions for basic mending, hemming, sewing and home decor projects. And this cute contraption does make sewing a breeze! The learning curve will be so moderate that even kids of 10 or less will be able to deal with it. Getting involved in a craft for the first time doesn’t have to be an intimidating, overwhelming experience, and Brother has proved it with this model. Let’s dig into the product description and see what features it has and what they mean for ya. The first thing you’ll notice in the product description is that it has 10 built-in stitches, which is just enough to get you started. If you are a sewing rookie, you might want to stay away from spaceships with hundreds of different stitch options. But how come that more doesn’t mean better in this situation? Imagine you’re dealing with a simple mathematical equation. Wouldn’t a standard calculator be a far better and more efficient solution than a scientific one? Sure, because it has fewer options that you don’t need. Why waste your time sifting through hundreds of operations when only ten of them will do? 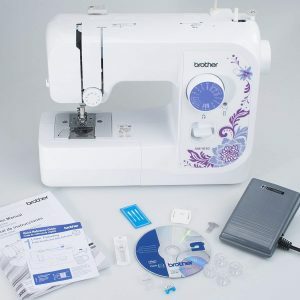 So, back to the number of stitches you will get with this machine: they include straight, zigzag, satin, blind hem, stretch stitches, as well as a four-step auto-size buttonhole. That should be more than enough for your daily work with elastic, stretchy, meshy fabrics, as well as hems. Selecting your stitches is easy with the stitch selector, which is in fact a knob with self-explanatory graphic markings. There’s a huge number of different specialized feet, depending on the fabrics, purpose and design of your project. If the four that come included with this machine aren’t enough for you at a certain point, there’s a ton of additional options on Amazon, many of which are compatible with this Brother machine. Should you need to work on areas that are trickier and harder to access, such as sleeves, cuffs, collars, just remove a portion of the flatbed base to convert it into free arm. This plastic portion will otherwise serve as an additional storage for tiny accessories, aiding your organization. 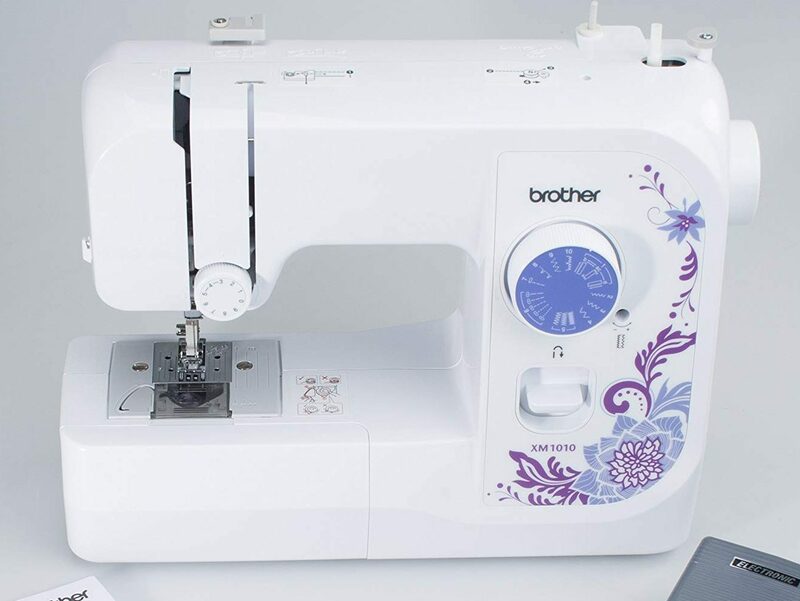 One of Brother’s signature features is the jam-resistant, top drop-in bobbin, and this machine has it as well. Bobbins that jam easily and are hard to wind are a sewist’s nightmare, and Brother have done their best to prevent this issue. In sewing, at least half of the entire work depends on the bobbin. It’s responsible for feeding the down thread to the needle so it could form a loop together with the top thread. So, if the doesn’t do its job as it should, your whole project might get spoiled. The bobbin has a transparent casing, so you won’t run out of thread unexpectedly, and automatic bobbin winding it is easy-peasy. You don’t have to pull out the DVD or manual. There are graphic instructions engraved on the surface of the bed, right next to the bobbin case, making the process intuitive and self-explanatory. Both the bobbin and top thread have their separate thread cutters placed conveniently, so you don’t need to use scissors. Adjustable thread tension means your stitches will be smooth and even, ensuring that the fabric doesn’t bunch up and that the seam will look consistent on both sides of the fabric. On this machine, it’s easy to adjust it with a knob. If you’re a complete beginner, it’s likely that you won’t want to touch the thread tension knob for fear of messing something up. But as your skills grow, so will your need to be in control of every single factor. The fact that this machine is reasonably priced doesn’t mean it will break soon or easily. You will get 25-year limited warranty, as well as free phone support for as long as your machine lives. Ease of use – it’s a great entry level machine. With it, sewing won’t seem like rocket science even to a kid. And I mean it! My 10-year old nephew made his first stitches on it out of mere curiosity, and that’s what got him into sewing. Even if you have any doubts about the setup, there’s an instructional DVD that comes along with the user’s manual. Not to mention a number of instructional videos on Youtube made by sewists like you and me. Weighing only 10.8 pounds, this charming machine won’t be a pain when you need to bring it from one room to another. But don’t let the weight trick you – this is not a toy, nor is it a small machine. Sure, it’s not nearly as bulky or heavy as an industrial machine would be, but it still does everything it should and more. Bring it to your sewing class, school, wherever – it’s light as a feather. Consistent stitching. Both straight and zigzag stitches are pretty nice and consistent. Presuming you don’t experiment with too thick materials or multiple layers of fabrics, you will get results that even a much more advanced machine wouldn’t be ashamed of. Convenient reverse stitch button. Backstitching is one of the most important things to do if you want your stitches to be tight and look tidy. Once you’re 3 or 4 stitches into the seam, press the button to go back and reinforce your stitches before proceeding down the seam. Make sure not to backstitch more than once or your seam will look messy. Stability. One would imagine that such a lightweight machine would bounce up and down (and off!) the table while sewing. It may sound unbelievable but this machine is pretty balanced and solid, even though it’s made of plastics. Very reasonable pricing. Having a professional hem a few pairs of your jeans or whichever other clothing could easily cost more than this machine. It will pay itself many times over even months into use, and even if you only use it for hemming or mending clothes. It even offers some advanced features. One-step buttonholes normally don’t appear in low-end machines such as this one. You would typically have to splurge a couple hundred dollars to get this feature. And it’s not at the expense of quality; this cute Brother does a fine job on buttonholes, which are one of the trickier parts in sewing. Great gift idea. Even though the looks aren’t a crucial feature in a sewing machine, hardly anyone can deny that it’s awesome when it goes nicely with your interior. The white and purple floral pattern doesn’t scream “machine”. 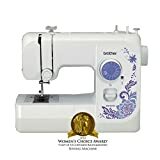 It strikes me more like a charming addition to the creative nook in your home than a sewing workhorse – which should be great if you know someone who’s interested in learning how to sew. No automatic speed control. The only way you can control the stitching speed is by using the foot pedal. The slider for automatic control is a feature in Brother’s more expensive models, such as Brother SE600. I’m not even sure if I should regard this as a real con. You can’t expect to get a cyber machine within this price range. No automatic needle threader. Just like everything else, needle threading is not complicated on this machine, but it’s not automatic and can be a bit of a problem if your vision is not excellent. It’s not an expensive feature, as Brother has it on some of its other low-end models. Won’t meet the advanced sewists’ needs. That’s not a real con either – it’s just a question of purpose. It wasn’t meant to be a machine for professionals, nor can you expect it to be. Newbies need tools tailored to their needs too. As far as affordable, light duty beginner machines go, Brother has done a wonderful job with this model. If there was a single most elegant way of learning how to sew, this would be it! Once you’ve developed and upgraded your skills sufficiently and chosen a direction that suits you best, you will be able to proceed with a more advanced model, but this Brother will still be there for smaller and simpler projects and tasks. It’s that kind of a machine that every household can put to good use.